The Halton Violence Prevention Council (HVPC) is continuing its objective to end violence against women and children in the community by raising awareness all November as part of Woman Abuse Awareness Month. 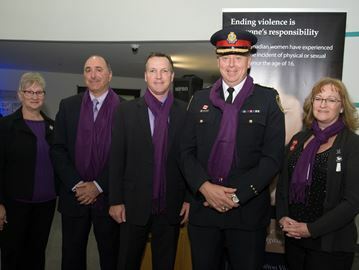 Regional Chair Gary Carr and Halton Police Chief Stephen Tanner joined members of the HVPC council last Thursday in raising an Act Against Violence banner, and launching the Purple Thursday campaign. The movement encourages people to wear purple every Thursday in November to promote awareness and start conversations about woman abuse and gender violence. HVPC members are from more than 20 agencies across Halton, including those in legal and police services, counselling and sexual assault agencies, women’s shelters, child protection, addictions, housing and mental health sectors, health-based services and survivor-informed agencies. The council has engaged this year in bringing people together for its Our Stories Matter survivors’ speakers’ bureau, where survivors of interpersonal violence can listen and share their stories. HVPC also continues to be an active part of the Neighbours, Friends and Families Campaign — a provincial education strategy in place in 200 communities across Ontario to raise awareness about the signs of abuse. For a complete list of council members or further information on the speakers’ bureau, the initiatives of HVPC and/or Woman Abuse Awareness Month, contact the HVPC co-ordinator at 905-637-5256, or hvpc.coord@accesscounselling.ca. The Halton Women’s Place 24-hour crisis line can be reached at 905-332-7892 (Burlington location) or 905-878-8555 (Milton location). The Assaulted Women’s Helpline can be reached toll-free at 1-866-863-0511.